The Adriel bedding ensemble by Croscill mingles luxury with a fantastic price. This collection features extravagantly embroidered comforters and drapery panels, and fun accent pillows. Fabric from this collection features cotton and polyester. No detail was spared when this collection was created. Mix and match the fun chevron embroidered throw pillow with the more muted Euro shams to create a look that will be pleasing to a variety of decorating styles. Croscill has offered high quality and on trend bedding for more than 50 years. 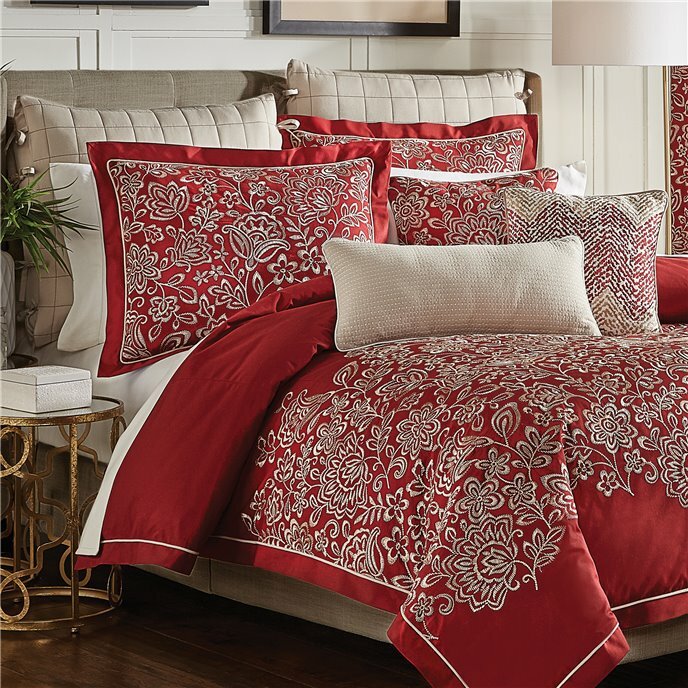 The Adriel Bedding Collection is absolutely stunning with its linen colored floral pattern densely embroidered on a beautiful red comforter. The comforter and pillow shams are 100% Cotton and poly fiber fill and are further enhanced with a linen covered cord and a flange. PLEASE NOTE: Embroidery detail on comforter only covers the mid-section. One (1) King Comforter, Two (2) King Shams, Comforter measures 110x96, 100% Cotton and poly fiber fill, dry clean recommended, imported. Manufactured by Croscill. The Adriel European Sham features a linen colored quilted fabric with red stitching. This sham reverses to the linen colored quilted fabric and is trimmed with beautiful bows down each side. One (1) European Sham, Measures 26x26, polyester fabric, dry clean recommended, imported. Manufactured by Croscill. The classically simple look of the Adriel 24” x 12” Boudoir Pillow is eye-catching. This pillow features a solid linen quilted fabric on the face, reverses to a solid ivory fabric and is trimmed with a solid ivory covered cord. One (1) Boudoir Pillow, Measures 24X12, polyester fabric and poly fiber fill, spot clean recommended, imported. Manufactured by Croscill. The Adriel 16” x 16” Fashion Pillow features a lovely, classic chevron design embroidered on the face of the pillow. This pillow reverses to a solid ivory fabric and is trimmed with a linen covered cord. One (1) Fashion Pillow, Measures 16x16, 100% Cotton and poly fiber fill, spot clean recommended, imported. Manufactured by Croscill. The Adriel Back Tab Window Panels feature a stunning linen colored floral pattern densely embroidered on a beautiful red ground. Each panel is lined with a solid white polyester lining and include encased weights in the bottom hem. Two (2) Panels, Measures 82Wx84L, 100% Cotton, dry clean recommended, imported. Manufactured by Croscill. The Adriel Back Tab Window Panels feature a stunning linen colored floral pattern densely embroidered on a beautiful red ground. Each panel is lined with a solid white polyester lining and include encased weights in the bottom hem. Two (2) Panels, Measures 82Wx95L, 100% Cotton, dry clean recommended, imported. Manufactured by Croscill.